Dormez-vous? (Are you sleeping?) is a project for children and young people with Special Educational Needs, who are on the autistic spectrum or who benefit from support with communication. 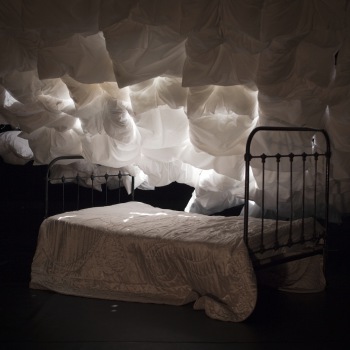 It is part of Opening Out, Crying Out Loud’s commitment to developing and delivering bespoke performances and creative residencies for children on the autistic spectrum, and was developed with French company, L’Insomnante Company. Dormez-vous? is a creative residency programme and theatre experience, that takes place in special schools for children with autism. The interactive and highly engaging workshops are designed to give children with Autism Spectrum Disorder (ASD) the opportunity to explore creative activites. The residency is led by L’Insomnante Company and educational experts on autism, Slavka Jovanovic and Joanne Skapinker. Dormez-vous? focuses on the theme of sleeplessness. 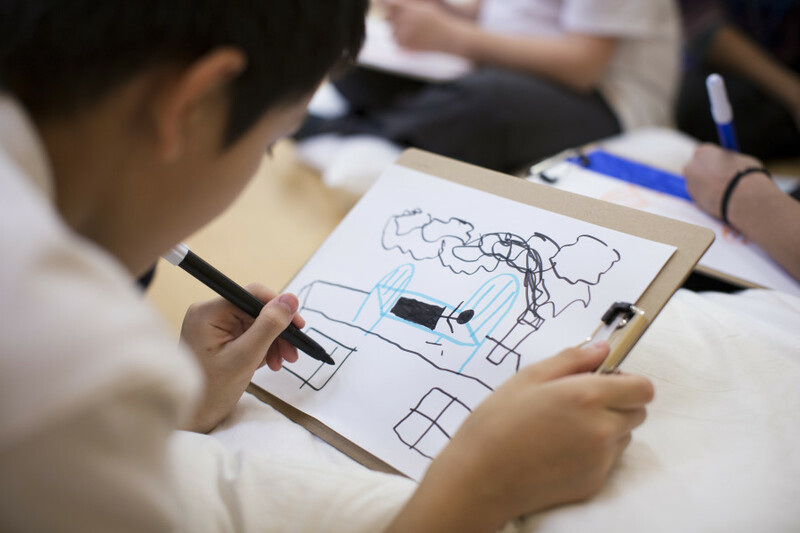 Using a range of non-verbal and visually focused workshops, the students are encouraged to express different feelings and thoughts on the subject of sleeplessness. 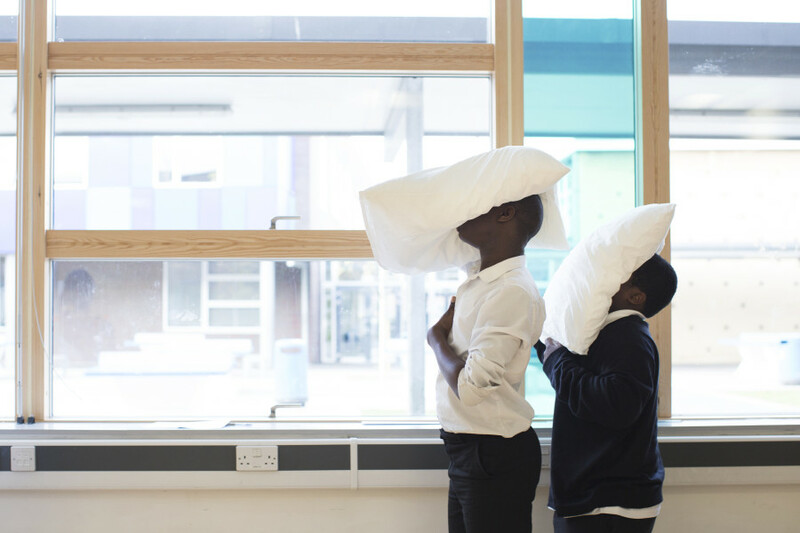 In the creative workshops, 100 white pillows become the students’ playmates. They become a path to walk on, a tunnel in which to hide, an artist’s easel, an unusual orchestra and a comfortable spot for a nap. A bed transforms into a screen onto which we project images; pictures of the previous day’s workshops or of the show which the group watches at the end of the project. All of the workshops are accompanied by live music, which lends rhythm to the workshops and creates a calm atmosphere. The creative residency is designed to promote communication, socialisation, playful interaction and creative interaction, encouraging participants to find new ways to connect to the world around them. To prepare the students for a 30 minute theatrical performance, one that is bespoke to their residency. To date, residencies have taken place in special schools in Poole, Cherbourg, London and Eastleigh. The University of Kent, in collaboration with the National Autism Society, recently published a survey showing the positive impact that drama and performance activities have on autism symptoms. Children with communication and interaction issues respond very positively to sensory environments in which they are free to wander, while potentially finding other ways of connecting with the world around them. The study concludes that all children involved in sensory arts experiences benefit from improved communication and interaction skills and maintain their changes post-intervention. With these findings in mind, Crying Out Loud in collaboration with the French company L’Insomnante and their artistic director Claire Ruffin, created Dormez-vous? for children on the autistic spectrum who have speech, language and communication difficulties. Dormez-vous? is a unique experience and show, not only for children with autism, but also for their teachers, caregivers and parents. Workshops that are designed to fit the needs of the participating children, based on a pre-residency visit by the education consultant and/or reports from the school. An introduction to new tactile and sensory exercises, that explore the themes of sleeplessness and relaxation, to the students and teachers/carers/parents. Resources are provided to recreate the experience in the classroom or at home. Each end-of-residency performance is bespoke to the children’s experiences. Elements, such as artwork, sounds and movements, that are created by the students are incorporated into the final performance piece. Take-home gifts that include elements from their residency, such as copies of the music, images and photographs that document their experience. The workshop starts with a ‘pillow path’. Following this same routine at the beginning of each session enables participants to feel comfortable and reassured in the workshop space and gain confidence. Walking along the path, the students leave the classroom behind and enter into a imagined and imaginary world of Dormez-vous? Our 100 pillows from a winding path, along which students walk. When they arrive at the end of the path, they sit down on the pillows in a circle ready for the start of the day’s activities. Everyone walks holding a pillow. 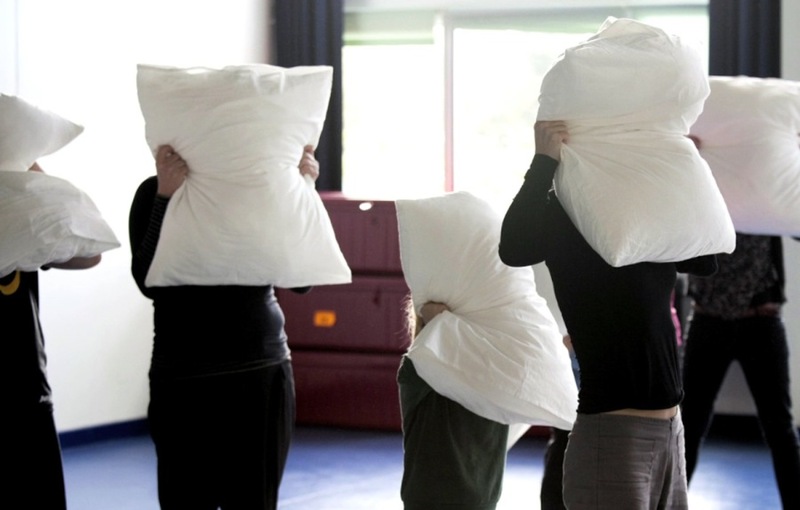 When the participants hear the musical signal, they throw their pillows in the air, find it again and go to sleep on the pillow. A second musical signal lets everyone know when it’s time to wake up and walk with their pillows again. Each participant chooses a sound which they hear in the night or when they wake up in the morning. A leader uses simple actions to conduct a choir of sounds of the day and night, indicating which sounds to make, and varying volume and tempo, to improvise from the young people’s ideas. Participants can also take it in turns to become the choir conductor. Somebody sleeps in the bed. The other participants form the choir of sounds of the day and hight as described above. Every time the sleeper pretends to nod off, the choir makes noises to disturb them. This is the final activity in every workshop. Together, the students place all the pillows in a giant pile and take it in turns to jump into the middle. The evaluation provided by teachers and pupils participating in Dormez-vous? demonstrates how much the children have been transformed by the process, and the benefits they gained from an immersive creative arts residency. Teachers have effused about individual children and their personal journeys; children who never make eye contact found that they could fix focus; children who can’t normally settle were totally engaged; and some of the participants who are elective mutes, chose to speak. In the case of three of the participants, they were so enthused by the project, their confidence boosted to such a degree, that they took significant speaking and performing roles in subsequent school productions. Dormez-vous? was comissioned by Crying Out Loud. Residencies for this project have been supported by the PASS Circus Channel project, Lighthouse Poole, and La brèche.